I always make something for the solstices, and I try to for each equinox. This month I have been distracted by many things and I completely forgot that the autumnal equinox was today until Sunday morning. Unfortunately my Sunday was planned already, so I got up with Katurah at 4:30 on Monday and started designing this. I had the design done by 9:00 and had it all cut out by 4:00 pm. I try and knock out a papercut from start to finish on New Years Day, but that is the only time I do something at that pace. For some reason, doing one for today seemed important yesterday morning and here is the result. You should see some of my crazy alternate ideas for this. I had on Richard & Linda Thompson, Jimmie Rodgers, The Divine Comedy, Galaxie 500 and House of Love most of the morning if you are wondering where my head was. This is not a representation of a real stone circle; I made it up, but it was inspired by the very few ocean side megalithic structures on the coast of France. The symbol in the corner is the Wheel of the Year symbol for Mabon, which is today, with a bay branch inside of it. I learned a lot about Mabon yesterday that I did not previously know. This had several titles. I often have a hard time naming my work. I want it to represent what I was feeling while making it, but I also hate defining it. I infer so much from my inspirations that I wouldn’t want to nail down a specific meaning for anyone viewing it, so…husband/wife, brother/sister, widowed neighbors, orphans, cousins, strangers, someone in custody…your call. I will tell you the boat is leaving. This is a partial remainder of a calender I had been working on back in 2012. I was going to do the images for 6 months and the cover. Originally this border of squirrels, rib cages & feathers was going to be the cover and there was a different image in the center. Shortly after I finished the papercuts for the individual months, the project fell through and I parted ways with the partner creating the other 6 months. Over December of 2012 I changed the image in the center and cut this out. Right after I finished it, I was commissioned to create an elaborate tour poster that took me a few months to do and this got filed away and forgotten. I was organizing some paper on my floor last week (does anyone want to give me a flat file?) and I came across the portfolio case I keep several old papercuts in. Going through everything, I decided I should take this one out, frame it and take it down to the Waxwing. 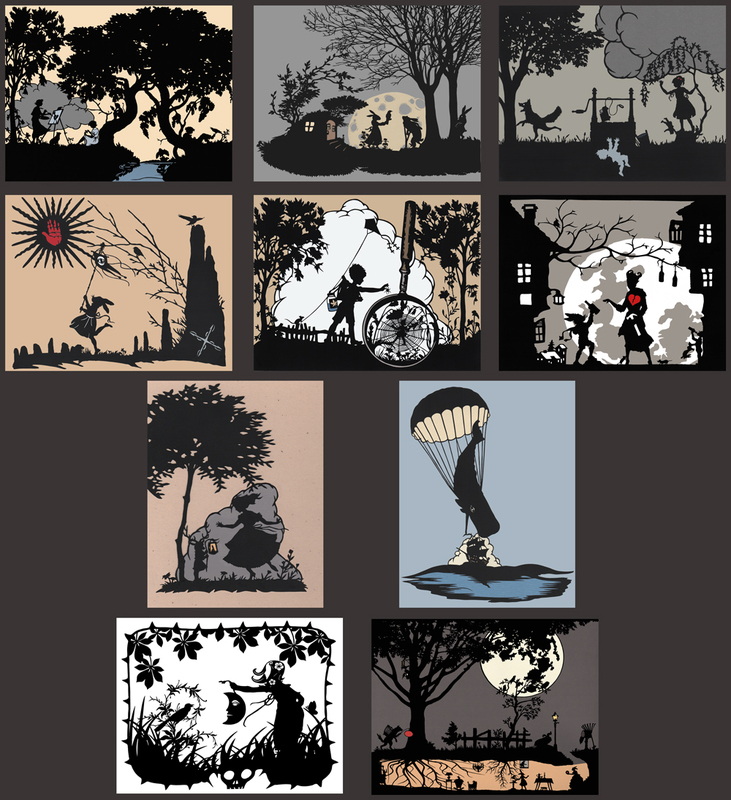 I have dozens of old papercuts, but the second half of 2012 was when I started making them detailed and elaborate enough that people other than friends might want them. The best of the calender cuts are all gone, so this will probably be the oldest piece of work I ever sell. It’s at the Waxwing now, unless someone bought it Saturday or Sunday. I dreamed this up a long time ago. I wasn’t happy with my initial design and forgot about it like many, many others. I generally make about 1 out of every 5 things I design. When the doldrums strike and I can’t think of anything, I go back through all of my rejects. I’m not sure what didn’t pass the muster initially with this dreamed still-life heartbreak. I may have been too focused on the color red. That happens. I have a feeling and it needs to be represented in exactly the way that I need it to be, instead of the way that it lends itself. I’m such a dork about symbolism that I sometimes let it get in the way. For this, I’m sure it was the color red. I needed it to be there. I needed someone to be guilty when in fact, no one was. Thank you, time, for letting me kick my symbolical crows. Instead of this being lumped in my group of misdeeds, it will now be slotted in the genre of my “passage of time” pieces.